IPv4 address shortage: Who was the first to become concerned? Subject:   Running out of Internet addresses? just plain run out of addresses. "The connector is the network"
Back then we used IP addresses in a considerably sparser way than we do today. That message kicked off a lengthy discussion in which nobody seriously was in denial about the potential for a problem. You can find the whole archive of the exchange here. There were two concepts that were touched upon. The first was whether or not we could use the so-called “Class E” space (240.0.0.0/4). I and others gave this serious thought at the time. However, the related issue which won the day was that fixed address lengths were an important property to be maintained. Vint Cerf raised that design consideration as a question. He also raised the possibility of using variable-length OSI addresses. Author EliotPosted on July 12, 2011 Categories InternetTags History, IPv4, IPv6, shortage3 Comments on IPv4 address shortage: Who was the first to become concerned? Here comes World IPv6 Day! As you may have read in the press some time ago, the world is running out of IP addresses. Really the world is running out of the current version IP addresses. An IP address is the means by which your computer and my computer can communicate with each other. Addresses are similar to phone numbers in that if we each have a unique number we both can call each other. How is it we’ve run out? Quite simply the IP version 4 address size is fixed at 32 bits, which allows for at most a little over 4 billion simultaneous computers to connect. Through the use of some sneaky tricks we are able to connect well more than 4 billion under the assumption that not device needs to be able to communicate with ever other device, but that game is getting a bit overplayed. And so over fifteen years ago, the Internet Engineering Task Force (IETF) created IPv6, which has enough address space to stick an address on every speck of sand we have in the world. More precisely IPv6 can handle 2128 or 340,282,366,920,938,463,463,374,607,431,768,211,456 addresses. NOW THAT’S A LOT OF PASTA! Nobody wanted IPv6 way back then when we had plenty of IPv4 address space, but now that we’re out of IPv4 addresses, it’s moving day. That’s because we’ve become mobile, and computers have gotten smaller. Not only can a cell phone access the Internet, but so can your printer, a car, a boat, a camera, your television, washing machine, many game systems, and many other things. Tomorrow is World IPv6 Day. Many service providers and web sites will be enabling the next generation Internet Protocol tomorrow to see what works and what breaks. Will this inconvenience you even just a little? Probably not. Here’s why: your home gateway almost certainly doesn’t support IPv6, unless you’re a geek like me, in which case IPv6 day might inconvenience me. 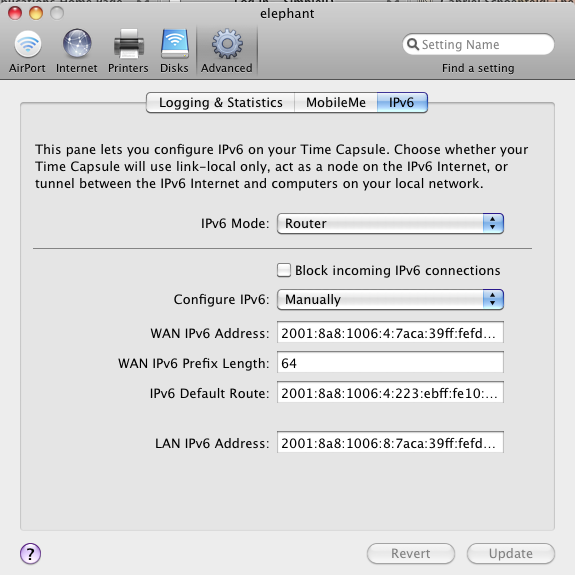 But I had to go to quite some inconvenience already to get IPv6 into my home, so what’s just a little bit more? Anyway, it’s all one big test to see how painful moving to IPv6 really is, and to see what breaks and what needs fixing. As service providers and web sites kink out bugs you’ll be hearing more about IPv6. Eventually, much like you did when you moved to high definition television, you’ll probably need a new router. If all goes well, the only difference you’ll notice is that eventually services like Skype and iChat AV will improve. By the way, this blog is IPv6-enabled! Author EliotPosted on June 7, 2011 Categories Complexity, InternetTags IPv4, IPv6, World IPv6 DayLeave a comment on Here comes World IPv6 Day! Looking to the left, one must select “Router” from the IPv6 mode and not “Host” as one might logically expect. Then, because RAs are not being handled properly, one must manually enter the default route (the long way). Finally, because you are supposed to be routing, you need to enter some address for the “LAN” side. My prefix is 2001:8a8:1006::/48. Note I’ve dedicated a bogus network ::8/64 to the effort. All of this allows me to do what should have happened automatically; not your typical Apple Plug-N-Play style, is it? For a company that claims to be IPv6 Ready, I’d say Apple still has a ways to go. Sadly, they’re better than most.